To the people who made the original Star Trek, the fan culture that sprung up around the show was at first flattering and then disorienting. Creator Gene Roddenberry cast the show with experienced character actors who’d spent years in Hollywood stuck in bit parts. When suddenly viewers started quoting their dialogue to them and asking questions about their process, they weren’t sure what to make of it. Initially, Leonard Nimoy capitalized on his newfound fame: making public appearances, giving interviews, and doing everything he could to keep his “Mr. Spock” popular. But as the character loomed large over the rest of his career, Nimoy struggled with how to respect what Mr. Spock meant to people, while also staying viable as an artist—and, whenever possible, spending time with his family. 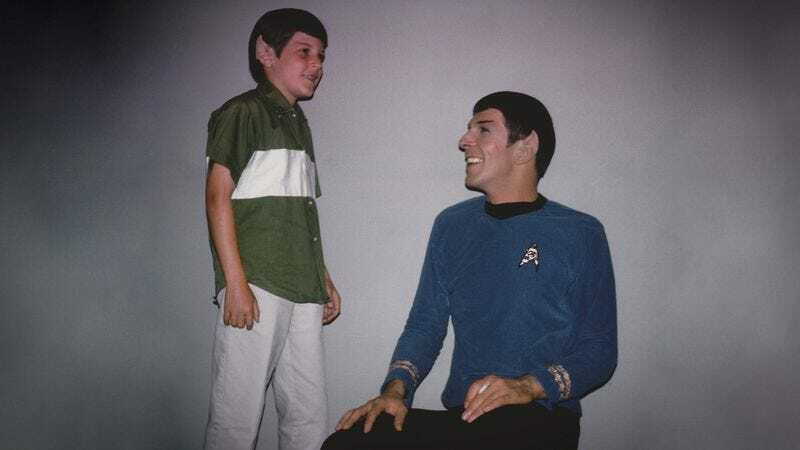 In Adam Nimoy’s documentary For The Love Of Spock, the actor’s son admits that his dad didn’t always succeed at striking that balance. At the start of the film, the director explains that this project was conceived when Leonard Nimoy was still alive—in collaboration with him, in fact—and was originally intended as a straightforward salute to Mr. Spock’s legacy and cultural influence. After Nimoy’s death, the movie evolved into a more complicated portrait of a star who was often combative with his children and conflicted about his success. The bulk of For The Love Of Spock honors the Nimoys’ plan to look back at Star Trek. The rest is more personal, and tells the story of how Leonard Nimoy spent the latter part of his life reconciling with his kids, and with his creation. Frankly, the fusion of For The Love Of Spock’s two sides isn’t always seamless. It’s laudable that Adam Nimoy chose to be honest about his father’s failings—and his own—rather than making an uncomplicated hagiography. But after a while, all of the “during those years my dad and I were barely speaking” interludes get repetitive, and take away from the larger appreciation of all that Nimoy accomplished outside of Star Trek. It would’ve been nice to get more than a few minutes of discussion of Nimoy’s formidable stage career, or his photography, or his oddball recording career, or his work on projects like In Search Of…, Mission: Impossible, and Invasion Of The Body Snatchers. (Fringe fans hoping for a nod to Dr. William Bell will be disappointed, as will anyone looking for comments on the controversial autobiography I Am Not Spock.) Even with the Trek material, after a certain point it gets exhausting to keep seeing similar shots of the Enterprise and similar footage from the show used as transitions and illustrations. 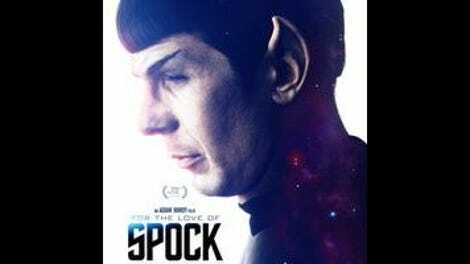 But will Star Trek and Leonard Nimoy fans get a lot out of For The Love Of Spock? Absolutely. Given his intimate relationship with his subject, Adam Nimoy has access to some phenomenal archival material, and a rapport with interview subjects that almost no one else could match. He brings in rare family photos, and includes chats with family members that are franker than the norm for these kinds of projects. The doc’s insights into how Spock came into existence aren’t exactly revelatory, but it’s still good to hear the actor’s thoughts on what he contributed to the character (like the “live long and prosper” hand gesture) and what came from his collaborators (like Spock’s reserved way of saying “fascinating,” and how William Shatner’s scenery-chewing as Captain Kirk allowed Nimoy to underplay). More importantly, the personal touch provokes some bracing moments that wouldn’t have been possible otherwise. It’s one thing to have Neil DeGrasse Tyson or various NASA technicians talk about how they were inspired by Spock—or even to have Trek-loving actors like Jim Parsons and Jason Alexander say that they sympathize with stories of Nimoy staying mostly in character when his show wasn’t shooting. But only Adam Nimoy could comment knowledgeably about what it was like to have a drunken argument with Leonard Nimoy and then walk out into a world where images of Mr. Spock were impossible to avoid. The best scenes in For The Love Of Spock are the most conventional, featuring famous folk praising a pop culture legend. But the scenes that most linger in the mind are more like the one where the director confesses his complicated feelings about his father to another Spock, Zachary Quinto. It’s moving to know that even Nimoy’s son is as in thrall to an icon as the rest of us.